Wolf Hall on PBS: My seven-point plan to survive Henry VIII. 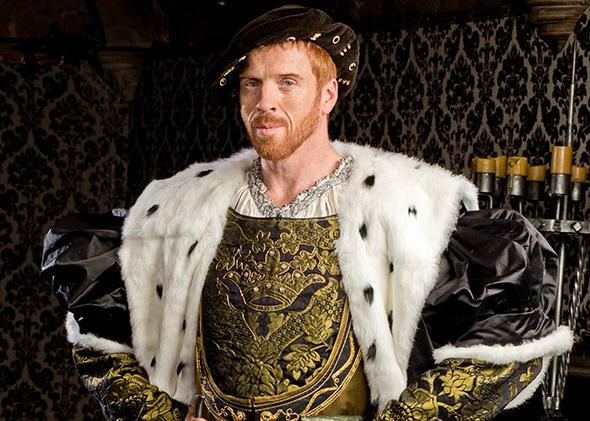 H8 criminal: Damian Lewis as Henry VIII in Wolf Hall. Photo courtesy Giles Keyte/Playground & Co. Pictures for Masterpiece/BBC/PBS. When I was 13, I began to channel a burgeoning obsession with the Tudors into an evolving plan—How to Outmaneuver an All-Powerful and Murderous King. This long-running time-travel scenario has occupied my daydreams ever since, driven by one very plausible question: If transplanted to 16th-century England, how would I survive the amorous attentions of Henry VIII, who married six times and had two of his wives beheaded? Ahead of Sunday’s hugely anticipated Wolf Hall—the miniseries adaptation of Hilary Mantel’s brilliant novels about Thomas Cromwell’s ascent and downfall under mercurial King Henry—I’ve decided to share the seven-point plan of Tudor-survival strategies I’ve developed over the last 24 years. Stay safe out there, ladies! Anne of Cleves, Henry’s fourth wife, was his luckiest: He found her unattractive and thus had their union annulled. But in the 1500s, I fear I’d attract slavish devotion on the comparative merits of my teeth alone. I’m assuming I’d arrive at Hampton Court at the marriage-minded age of 16, when I had a rosebud mouth, unpocked skin, a bosom made for ren-faire dresses, and childbearing hips (thanks, peasant stock!). Add to this a firm grasp of basic sanitation practices and generations of my people not marrying their cousins, and I’d be the very picture of feminine health. My first strategy when offered a token of admiration from Henry: Refuse it. Delay, delay, delay. Claim that my heart swells at his majesty’s attention, but that my maiden’s virtue demands that such gifts come with an offer of marriage, blah blah blah. Hopefully, the king would grow bored and move on. Then, having lost the sunlight of his favors through my womanly weakness (you have to massage the ego and self-denigrate like crazy with Henry), I’d ask to be banished to a nunnery. This was the safest place for women in the Middle Ages, a utopia free from loutish husbands and lethal childbirth, a haven for radical mystical experiences with literate women! Henry’s noble-bros, the Tudor courtiers, were grasping schemers who sought to use the king’s lust to their advantage. Thomas Howard—the Duke of Norfolk and Anne Boleyn’s uncle—pushed his niece’s agenda with the besotted Henry, and was rewarded for his machinations with land, riches, and titles. To repay the favor to the king, he later presided over Anne’s trial and sentenced her to death for sleeping with her own brother; six years later, he pimped out another niece, Catherine Howard, to Henry, and she, too, was beheaded for adultery. These noblemen threw everyone, even their own daughters—don’t get me started on Thomas Boleyn—under the proverbial plague cart for the smallest of advances. Second-guess them at every turn. That said, do everything possible to get on Thomas Cromwell’s good side. I’d like to appear at court as a vivacious presence, much as Anne Boleyn did, dazzling with my ability to dance as well as I read and recited poetry, expounding on Reformation theology and falconing like a boss. But Henry, swine royale, grew irritated with his intellectual-equal wife (who, as Mantel points out, wished to act as his adviser), and chose practically illiterate Jane Seymour, forever described by historians as meek and simple as wife No. 3. (No. 5, Catherine Howard, likewise could barely read or write.) Mantel depicts Jane, whose eye-rolling motto was “Bound to obey and serve,” as cannier about her role—she’d seen how having opinions worked out for Anne. In the interest of survival, I’d need to go Jane. Fortunately for me, and unfortunately for every other woman who lived under this idiocy for centuries, nobody expected women back then to be well-educated. I’d be expected to produce a male heir fast, and it would be my problem if it didn’t happen. First, I’d dispatch with the useless Royal Doctor, whose idea of medical care involves bloodletting and urine-tasting. Seek out midwives instead. (These women came from monastic orders and were considered “nursing saints.”) No more corsets. Drink weak beer instead of water, as it was free of disease. Take a break from strenuous daily rides with the king. Hope like hell for a boy. And don’t expect any sympathy if things go wrong—it was during her recovery from a miscarriage that Henry began accusing Anne of trickery and spell-casting. 5. Try not to talk about religion. The Church of England broke with the Holy See not because of theological disputes but because Henry didn’t like being told what to do. Real Reformation in England didn’t occur until the reign of Edward VI; in Henry’s time, the Church of England was still Catholic in its doctrine and practices, and the Protestants on the continent were largely considered radical heretics. I could get myself in all sorts of trouble by forgetting this timeline. In 1533, “Hey, I’d like a Bible in the vernacular, because my Latin’s not great!” could get me killed like William Tyndale, the English priest burned at the stake for translating the Bible into English. One little slip about how transubstantiation isn’t, like, literal, and it’s off to the pyre for me. 6. Try (and probably fail) not to talk about anything. 7. Act like a witch. That is, make Henry VIII believe that I am able to divine the future, and that his only path to greater power and a Tudor dynasty is in keeping me alive. Solve some important matters in the near future (the coming wars with Scotland and France), and predict greater matters in the long term (an heir will bring Catholicism back with a vengeance and a “bloody” nickname). Foresee many threats (closing the monasteries and killing Sir Thomas More will have unintended consequences and lead to A Man for All Seasons! ), but explain how I can protect him from them. This plan depends entirely on the extent of Henry’s paranoid delusions and narcissism. Some days, I think he would take it all in, tell Cromwell to get rid of me, then second-guess himself after I’d been beheaded. Usually, though, I think I could appeal to Henry’s superstitious and fearful state of mind, and make him believe. And thus would I live on, Supreme Witch and Survivor of Henry Tudor, my glorious head still attached to my body.